Internationally produced and recognized playwright Elana Gartner was has written Because of Beth (Productions: Howick Little Theatre; The Workshop Theater), Daughter (Reading: UpTheater Company; PlayLab Selection, 2013 Great Plains Theatre Conference), Before Lesbians (Reading: Oberlin College), Pilar’s Brother (Reading: Repertorio Español), Cortex Kin (Reading: Dixon Place), Spinning (Production:Fabrefaction Theater Company), and Ernie Evan (Productions: Genesis Repertory Theater; Heights Players, 6x10 Festival). Two monologues from Elana’s plays Daughter and Because of Beth were published in “Audition Monologues for Young Women #2: More Contemporary Auditions for Aspiring Actresses “(Meriwether Publishing, Ltd., 2013). Elana founded the EMG Playwriting Workshop which has fostered a supportive community for playwrights since 2004 and is also a member of the Manhattan Oracles playwriting group. Elana founded the International Centre for Women Playwrights 50/50 Applause Awards and served on the ICWP board for five years. Elana is a graduate of Oberlin College, a member of the Dramatists Guild and writes freelance articles for HowlRound. She is currently an MFA candidate at Spalding University. 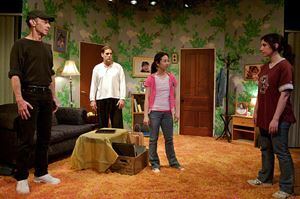 "Before Lesbians"; "Because of Beth"; "Daughter"; "At What Cost"; "Pilar's Brother"
Elana's plays can be found at her website, on the New Play Exchange and Doollee.